At Drumright Dental Center we go the extra mile to assure that patients with special needs feel welcome and cared for. We will discuss with you, parent or guardian, all treatment and financial options. A preventative and a restorative oral health treatment plan will be prepared just for your family member. When necessary, patients can obtain dental treatment under local or general anesthesia. The dentist will discuss your anesthesia options as well as location for dental treatment, at Drumright Dental Center or at Cimarron Surgical Care Center. Special Olympics Special Smiles, presented by Drumright Dental Center, is a dental screening designed to provide athletes with oral hygiene education, nutrition education and free protective mouth guards for those athletes who compete in sports that may require such protection. There is an overwhelming occurrence of poor dental health among people with intellectual disabilities. According to data collected from 9,000 Special Olympics athletes in 2001, 30 percent of athletes had visible tooth decay, 30 percent were missing one or more permanent teeth, 44 percent showed obvious signs of gingival infection and 4 percent had no natural teeth left in their mouth. 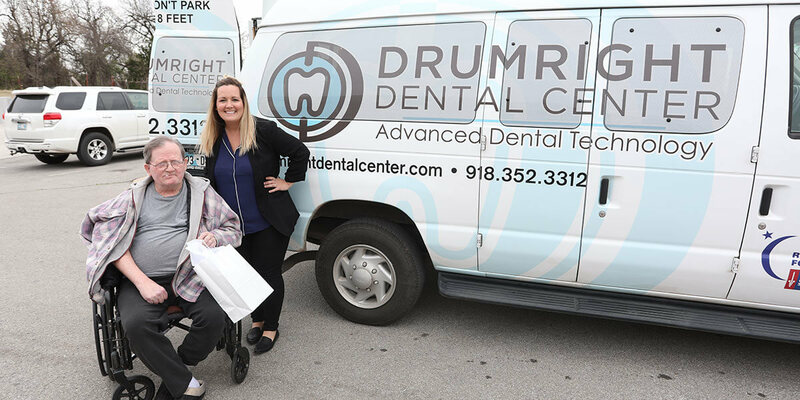 Drumright Dental Center proudly supports the Oklahoma Special Olympics – Special Smiles program. The entire staff attend the Summer games in Stillwater, OK and participate in the screenings.